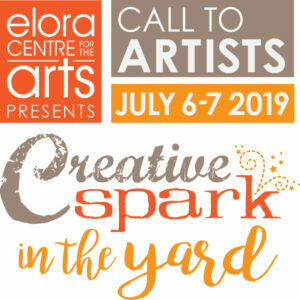 The Elora Centre for the Arts has partnered with Creative Spark Workshops for a summer event called ‘Creative Spark in the Yard’. This TWO DAY July show – Elora Centre for the Arts Presents: Creative Spark in the Yard – is a juried artisan, makers and artist hand made show and sale with great exposure across the region and to the GTA, in one of Ontario’s busiest summer tourist towns, Elora! The event has partnered with Elora & Fergus Tourism for marketing efforts, helping us spread the word far and wide. For more details regarding the marketing plan and event details please click here. The application for this show is now LIVE and information and application link can be found HERE. Early bird deadline ends April 1st – apply today! Final deadline for applicants is May 6th.